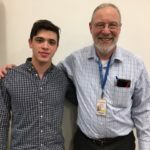 Mazal Tov to MTA Senior Joseph Friedman, who was named a National Merit Finalist. The National Merit Scholarship Corporation recognizes the top 15,000 out of 1.5 million students who take the PSAT each year. These students must confirm their outstanding score with comparable performance on the SAT and in school. By this designation, Joseph is recognized as one of the top 1% of students in the United States. Joseph’s impressive record goes well beyond the PSAT. With an grade average of more than 95, high scores on SAT and SAT Subject Tests, and top scores on seven AP exams, Joseph is also involved in many extracurricular activities, including editing two student-run publications, Academy News and Pearls of Wisdom, and serving as Captain of the College Bowl and Fencing teams. Joseph has already been accepted as a Presidential Scholar at Rutgers, and is awaiting admissions decisions from a number of top colleges and scholarship programs in the coming weeks.